Legendary members’ club Annabel’s in Mayfair has re-opened after a £55m redesign masterminded by man of the moment Martin Brudnizki. The decadent new incarnation of the club has opened two doors down from the original inside an 18th century Grade One listed townhouse in Berkeley Square. 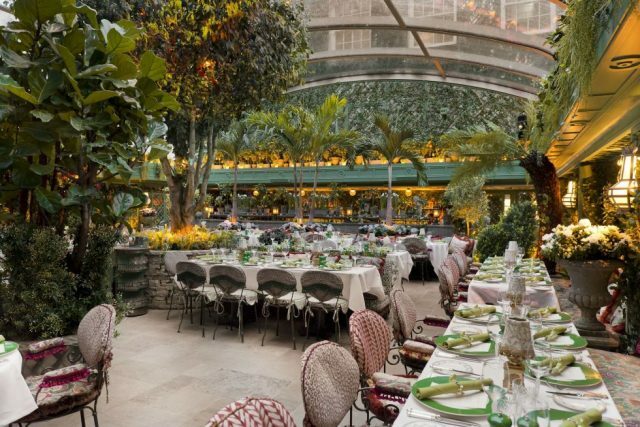 The showstopper at the club is The Garden, a stunning 120-cover flower filled space featuring a retractable glass roof meaning that guests can dine al fresco all year round. The room, which spans the length of the townhouse, features a hand-painted mural of an English country garden brimming with birds by artist Gary Myatt, a pair of pink tulip Murano chandeliers and a pink marble bar.